Likened to revered abecedaries of ancient times, this avant-garde collection of ancient-futuristic paradigms for the New World has been received from the akasha. Thought-provoking vignettes from this akashic record book of life convey various spiritual and cultural philosophies across our time continuum. They reflect an intentional correlation of Oneness in all. 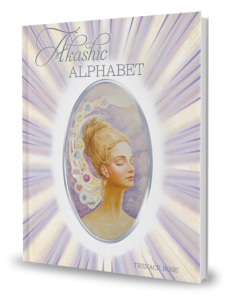 A unique Akashic Glossary further clarifies and broadens a panorama of understanding. This one-of-a-kind, research-based, spiritual-inspirational, art gift book of 72 pages, featuring 27 fine art master paintings, is of the highest quality. With a 4-color dust jacket, measuring 12 1/4″ x 10 3/4″, this hardcover is bound with white linen Saifu cloth, stamped in silver foil, with silk ribbon marker and specialty-weight pages. It offers a luxurious presentation to be treasured.